See you at the rink!!!! Our final practice of the year will take place Saturday @ 6 pm APM. Our NRMHA year-end tournament 1st game will be Friday @ 3 pm APM. Game # 2 in Crapaud Friday night. All of our 3 round robin games will involve off island teams. Stanley, N.B. 5-0-0 "Championship banner"
Congradulations team on your record, you have made us all very proud of your hard work and our team's accomplishments. The Standings are out and although we are tied for 3rd we are out because of less wins then the other qualifying teams. Thanks for your effort, 1 loss in 12 tournament games this season is still something we can be proud off. Our team West Masonry Flames of the Western Midget A league were involved with what we believe is a very huge accomplishment at any age level. It involved right Winger Morgan McNeill of our team and the scoring of 3 goals at the Stanley, NB Minor Hockey Midget tournament this past weekend. He scored 3 in 18 seconds!!! 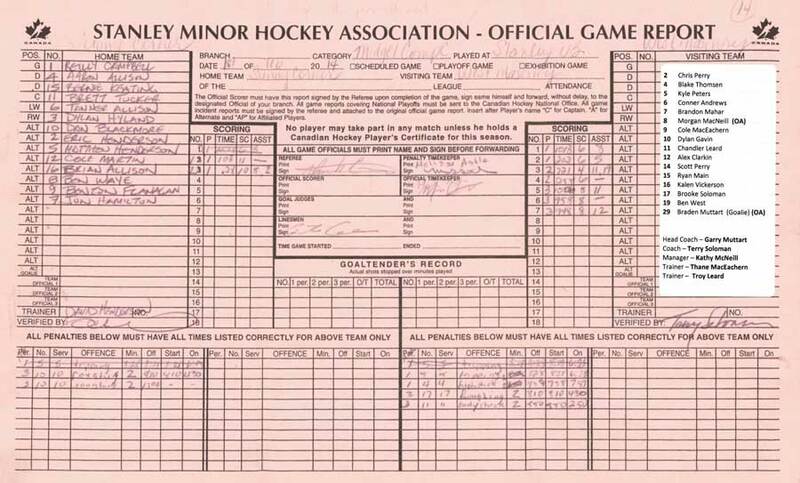 As you can see from the attachment his first was scored at 10:06, 2nd 9:58 and 3rd 9:48 of the third period, unbelievable. I heard that the NHL record was 21 seconds so if this is correct Morgan has marked that this is a huge accomplishment no matter what the league or level. We felt that this was definitely news worthy and as a team just wanted to recognize Morgan for this great Achievement. Time/Arena change / Now APM Gane vs NR # 3 @ 9:20 am. Nothing today in Rustico. Just advised that Summerside # 2 is hosting a tournament this weekend and as a result need to reschedle. Our next ice time will be this Sunday APM @ 8:30 pm vs Summerside # 1. As a side note please see that our practice next week will be @ the APM, 9 pm on Tuesday January 28 and not the usual Thursday in Crapaud. Also a reminder, I believe either Morgan or Chandler (memory lapse) are missing there A's should anyone have one on ther their sweater please remove it and forward to either Morgan or Chandler. Thanks, have a great week and see you all in Summerside on Saturday. Great "team" effort last night. We received a call 9:40 PM Wednesday night from NR corridinator David McQuaid about a open ice time Thursday night at the APM 6:20 PM. We said we would take it. I no it is last minute but if you can make it that would be great. Any ice time is better then none!!! Just received our new schedule. I will update calender ASAP. As per usual if yoyu are unable yo make any games please advise|Terry or I as soon as possible. Further games/schedule can be seen @ George Trainor Tournament website. Summerside has cancelled again!!! We still have the ice so we will practice half the time and scrimmage the 2nd half. We have an ice time Monday night @ APM. We have invited Summerside #1 to play the game that was cancelled due to weather Sunday night. Yet to be confirmed, either way we have icetime Monday night 8:40 @ APM. Summerside # 1, has advised that they will not be coming to the APM tonight due to weather and road conditions. As a result we will use our ice time for a much needed practice. Please check the weather (use your own discretion) prior to leaving. Just checked on line and the freezing rain is not to start till later this afternoon. Just spoke to Summerside coach and he said that it wasnt doing anything there. So I guess we will play. Should you have any concerns and think because of forecast you want to stay home, no worries, just let me no please 393-6175. Wednesday Dec 18, George Trainer Schedule should be released, anyone that has to work hopefully you can get a copy to your employer. 1) As you are all aware by now our game tonight has been canceled. I have been in touch with Alberton and they will play us on our practice time this Thursday in Crapaud at 8:10 PM. Anyone who will be unable to attend please let Terry or I know as soon as possible. 2) Regarding the George Trainer Tournament the schedule is yet to be released. I contacted them and they said the schedule should be out this Wednesday. 3) Kathy has advised that at this point in time the (Feb 20 - 23) Pownal Tournmant http://rh.goalline.ca/ goes we are on a waiting list. Keep your fingers crossed. 4) Stanley Tournament in NB, January 31 - Feb 2. Please remember to book your rooms so we can get our block rate. To book and confirm your room please call the Delta Reservations Office at 1-800-268-1133. We have been asked for ease of booking that callers identify themselves as being with West Masonry Flames. Reservation requests must be made by Friday, January 10, 2014 in order to qualify for our group rate. We have looked around and have found a tournament in Stanley NB. This is approx. 30 - 40 minutes outside of Fredericton. Do to the fact that there were very few options and we new from our parents/players meeting an off island tournament would be something we were in favour, we have sent in our application, to which it was accepted and at this point in time we are confirmed. We are now forwarding a cheque as requested. The tournament runs from Friday January 31 to Sunday Feb.2..
Just as a followup to previous e-mails, we are now registered in 3 tournaments. George Trainer (Dec 27 - 29)+ Stanley NB (Jan 31 - Feb 2) + Rodd/Pownal Feb 21 -23, 2014. As soon as further updates are known we will forward. At this point in time we are accepted in both George Trainor Dec 27 - 29 and Pownal Feb 21 - 23/2014. We were told initially from tournament advisor a few weeks ago that we had also been accepted in a NB Dieppe tournament but have just found out that Dieppe tournament has not materialized as we were lead to believe or thought. We will keep looking. If anyone else would like to look and help us find and secure something off PEI that would be great. 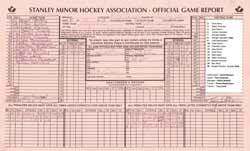 (9.2F) Any player or team official who engages in verbal taunts, insults or intimidation based on discriminatory grounds (race, ethnicity, religion, gender, sexual orientation, language) shall be assessed a Game Misconduct penalty. Notwithstanding the above, at the discretion of the Referee, a Gross Misconduct penalty may be assessed for any infraction to any player or team official. Hockey PEI considers these matters very serious. If players or team officials are found guilty of this playing rule or valid complaints are submitted, disciplinary action may be taken by the Hockey PEI Discipline and Ethics Committee against any member. Such disrespect towards opponents will not be tolerated. We ask all members to offer respect to your opponents, officials and team members. We ask that you share this information with your teams/members. As usual continue to check our NRMH calender for any updates. Please be at the rink and ready to go on the ice 10 minutes prior to icetime. Should anyone be unable to attend any of the above please let Terry or I no as soon as possible. Because our schedule has been so few and far between icetimes we have secured an additional practice time in Crapaud for next Thursday @ 9:20 pm. We realize this is late but feel something we needed. So the week of Nov. 25 we have ball hockey 7:30 pm Wednesday APM gym, Practice Thursday @ 9:20 Crapaud and game Sunday. Please continue to check schedule/calendar for any updates. Our team has booked the APM on Wednesday Nov. 27 @ 7:30 for a "Game On" ball hockey game. All sticks provided by APM, just bring yourself. Hope everyone can make it for some team fun.!!! please let Terry or I no as soon as possible. Please note our game vs. NR # 1 has been rescheduled (Lost ice to Early Bird Tournament) from Nov. 23 to Dec. 11 Wednesday @ 7:20 pm. Wednesday we officially begin our season. Lets giver!!!!!!!!! 16 players = 1 Team = team effort = fun for all!!! 8:30 pm is game time. Our team calendar has been updated for our games from now till Christmas. Our 1st regular season game is this coming Wednesday Nov. 6 vs. NR # 3. Practice times/dates are yet to be finalized. Before we can move ahead we need to have a team manager step forward to help guide the ship. If there is anyone interested could you please let Terry (628-8288 / 629-9681) or myself (368-7090 / 315-2057 - temporary cell number) know as soon as possible.